Like all seeds, chilli seeds are reasonably easy to germinate. Initially, their main requirement is heat. Obviously, it is best if possible to keep the seeds indoors, if not in a house or garage, then at minimum in a greenhouse. Even when they are in a centrally heated house there are things you can do to maximise the heat. Try putting the seed tray in warm spots such as on top of the fridge or in an airing cupboard. Alternatively, you could buy a heat pad from a garden centre and place the tray on top. This will ensure a constant warmth is supplied to the chilli. During germination, moisture helps the seeds by softening the pods from which they sprout. Pre-soaking the seeds in warm water (not hot) prior to planting in compost can help speed up the germination process. If you have the seeds in a warm area as suggested in tip 1 above be sure to not let the planting medium dry out. Try and keep the medium moist to touch but not wet. A small water mister is best to use rather than pouring water straight into the seed tray. You can plant the seeds straight into individual pots however a seed tray will allow you to plant more in a confined space. Fill the tray 3/4 full of fine compost (sieved if possible). Then add the seeds in straight lines leaving about 5cm between seeds. Next, sieve over another 3-5mm of compost. Be sure to label the seeds if more than one variety is being grown. Place a cover over the tray and place somewhere warm. The seeds should sprout after anything from a few days to a few weeks. You should try and leave the seedlings in the seed tray until they have sprouted their first true set of leaves (the second set that appears). It is a good idea at this time to throw away any weak looking plants and only pot on the strongest plants. This of course, depends on how much space you have available to grow them, just remember they take up a lot more room once they are fully grown plants! Everybody needs to grow chillis for cooking. Even if you don't like hot food, just a little hint of chilli to warm it up stimulates the taste buds and everything else tastes just so much better. True. 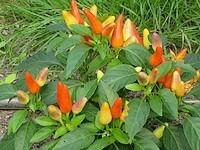 And chillies will brighten up your garden! But before we get to the instructions for growing chillis, lets sort out the spelling, lest you think I don't know any better...There are three ways to spell the name: chili, chilli and chile. Chilli plants love heat. They are closely related to capsicums/bell peppers and also related to tomatoes (they are in the same family, the solanaceae), but chillies prefer their growing conditions a lot hotter.Chilli seeds need 20°C to germinate, and it should be 30°C or more for the fruit to ripen. Night temperatures should not drop below 15°C. (At least not on a regular basis. 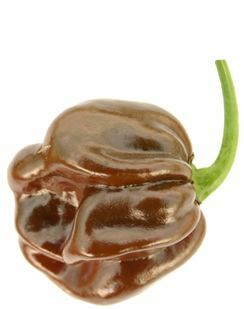 The odd cool spell is ok.)Chillies also don't mind humidity as much as sweet peppers or tomatoes do.Most people will need to grow chillis in full sun. In the hottest, sunniest regions chillies still grow well with a bit of shade. Especially afternoon shade can even be beneficial. (The fruit can get sunburned. )If you live in the tropics or subtropics, great. Your chillies should thrive. Even the "annual" varieties should live for two to three years and they produce fruit all year round.If your climate is not tropical, don't despair. You can still grow chillies if you get decent summers. And you can extend the growing season by growing chilis indoors, just like you do with tomatoes.In fact, chillis are also related to tomatoes, so the growing methods and requirements are similar. Except that chillies need more heat.People with small gardens or balconies will be pleased to hear that you can grow chillis in pots. You can buy chilli plants in a nursery or you can grow chillis from seed. The seed needs at least 20°C to germinate. Start them in early spring in cooler climates or any time during the dry season. (You could start them all year round in the tropics, but it's a good idea to let the plants grow strong before the wet season hits them.) Chilli plants are usually started in seedling trays or small pots. They are very vulnerable when small and they don't grow all that fast.Still, I prefer to start mine directly in the ground, because like capsicums chillis don't like being transplanted.Actually, I only start them in the ground when I have enough seed to allow for a high percentage of fatalities. (I am the laziest gardener I know, so I don't look after my seedlings much.) I usually have enough because I save my own seed.If I buy seed of a new chilli variety and I get one of those tiny packets with barely a dozen seeds in them, then I start them in pots. You can plant several chilli seeds per pot. Once your seedlings have a few leaves, snip off the weaker ones and only keep the strongest. You only want one chilli plant per pot when you plant them out.Otherwise you will disturb their roots too much and they HATE having their roots disturbed.If you grow chillies in seedling trays or little punnets, plant them out once they have four to six true leaves (about 5 cm tall). If you don't, their roots will start feeling restricted and it will set them back.Chillies don't mind growing in bigger pots, so the timing for planting them out is not critical if you use pots. If you live in a cooler climate, use pots. Let them to grow to 10 to 15 cm. Make sure it's warm enough before you put them outside!Water the chillies before transplanting, so the soil doesn't fall apart when they're removed from the pot. Be VERY careful when removing the seedlings from their pots.Drop them in a hole in the garden, fill it back in, firm down the soil, water, done. Chillies grow in a variety of soils. Like most plants they grow better in rich soils and produce more fruit, but they will grow in any reasonably fertile soil and don't need any special treatment. If you use plenty of mulch and compost in your garden the chillies will grow just fine.If your soil is poor, you'll have to fertilize your chillies. (And start using more mulch and compost...)When fertilizing chillies keep in mind that, like their relatives and indeed most fruiting plants, chillies like potassium. Too much nitrogen will make them grow lots of soft leaves and no fruit.It is important to keep your chilli plants well watered and mulched. Mulch not only improves soil over time, it also protects it from drying out.Chillies have such a tough and hardy image, people often don't realize how sensitive they are when it comes to lack of water. Make sure your chillies have plenty and never dry out.At the same time, don't overwater. The soil should be free draining. Chillies don't grow in swamps. Chillies have weak branches. If they are loaded with fruit they can snap off. The whole plants are prone to branches drooping on the ground and breaking off, so you may want to give them some support. (I don't. I just cut off the broken branches and the bush grows new ones. Chillies don't mind if you prune them. )A stake will also prevent the whole plant from toppling over, which also happens because their roots are only shallow and not very strong.Root know nematodes can cause the plant to weilt and die for no obvious reason. However, root knot nematodes are a sign of very poor soils. If you add lots of compost and mulch to your garden you shouldn't have any trouble.Other than that chillies grow happily and aren't bothered much by any pests or diseases. If they struggle it's usually a sign that the soil is not as fertile as you thought.Did I mention that compost and mulch is great stuff? Chillies are quick to fruit and flower. How quick depends on the variety and on the temperature.You can harvest the first chillis green once they reach full size. Or you wait until they turn red, or whatever colour they are supposed to turn.If you plan to dry them for chili powder or flakes, you can even leave them on the bush until they shrivel up and dry.To harvest fresh chillies cut or pull off the mature fruit while it's still shiny and plump.If you pull it off, pull it upwards, exactly opposite to the direction in which it bends down. Then it should snap off at the joint, without breaking off the whole branch. Otherwise just snip them off.The fruit will last in a sealed bag in the fridge for up to a week.You can dry it in the dryer or sun dry it, you could also just string it up and hang it up to dry in an airy spot.Pound it to flakes or put it in the blender to make cayenne pepper and chili powder. You don't need to eat chillies for them to burn you!Just wait till you get Habanero chilli juice under your fingernails for the first time... When cutting fresh chillies, make sure to scrub your hands well after. Don't touch your skin and especially don't touch your eyes! The hottest chillies can make you go blind. I am not kidding.When working with dry chilli be VERY careful not to breathe in any powder. Also don't get it in your eyes. The toughest and most prolific, the one that anyone should be able to grow, is a huge bush of the Birds Eye type.Those bushes grow to two metres in size and are always loaded with chillies.The tiny fruit is blistering hot. The wild birds love them (did you know birds don't feel the heat in chillies?) and so do my chickens.The seed spreads through the garden via birds and chickens, and I am forever pruning and chopping the bushes everywhere...My favourite culinary variety is a type of Cayenne pepper, a medium sized bush with darker leaves and long skinny fruit of medium heat.I always have a few bushes growing near the kitchen door, and I step out there on a daily basis to get some chillies. I dimly remember once, many years ago and living in a different place, I bought seed for a "Perennial Capsicum", a bell pepper that lives for many years and fruits all year round. I was a bit disappointed because it tasted nothing like the capsicums I knew. So maybe that's its offspring.Anyway, I do grow all the chillies I need and then some, without ever having to buy seeds and without putting any work into it. Who cares what they are called! 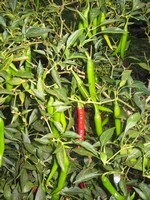 Chillies are grown in full sun, but in Adelaide the climate is very harsh, and the sun can be fierce. Growing them under trees, in the shade house and even in a glasshouse has proved to be successful. Chillies are shallow-rooted plants and when they are grown in a container their roots will remain warmer in winter than if they were grown in the ground. There are likely to be more failures through dieback and death of the plants in the ground than in pots, which have the other advantage of being able to be easily moved to another location if they are not happy in the one where they are growing. 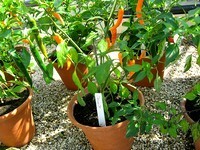 A 20 cm pot is adequate for growing most chilli plants. They are very hardy and even have the ability to recover from leaf drop as a result of drying out. They can be pruned back in winter and will re-shoot with fresh new growth. For economical use of space, it is possible to grow three different varieties in one larger 30 cm pot. Containers with a water-well in the bottom will only need to be watered about once a month. Using a roasting thermometer, boil the mix for 15 minutes between 105 and 120 degrees C, moving the mixture on and off the heat source to regulate the temperature so that it does not overheat. When the resulting mixture has cooled it can be stored for about 6 months, and then can be filtered through a simple paper coffee filter to give a clear oil that can be used for cooking at any time when chillies are not seasonal. 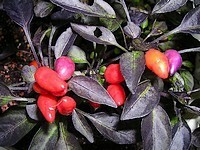 Chilli plants are very ornamental plants in the garden, especially when their colourful fruit is displayed on the shrub, whether they are used for eating or not. They are both hardy and tasty.